Topster is an innovative new product to make your life easier. If you purchase milk in big plastic bottles, you’ll know how it can 'glug' as you pour, making for messy splashes and milky tea. For more controlled pouring with fewer drips, attach one of these clever, spring-loaded pourers to the top. Invented by a busy dad who was forever filling his young daughter's beaker with milk, they're reusable, colour-coded, and will fit most plastic milk bottles. This award winning invention is also ideal for those with arthritis. 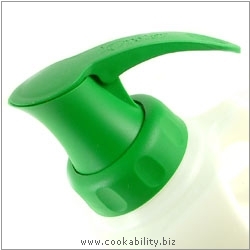 Attach to plastic milk bottles to simply pour and store milk. The well designed spout eliminates any mess and drips. The easy reach, spring loaded handle controls flow when pouring. It fits most plastic milk bottles and different sizes, e.g. 1/2/4/6 pints. Transforms the appearance of your milk bottle, turning into an instant jug!